The 2450 Pressure Transmitter has a one piece injection molded PVDF body and ceramic diaphragm for superior compatibility in corrosive liquids. Three pressure range versions allow for optimal resolution matched to sensing needs. Solid state circuitry eliminates drift (no internal potentiometers). Built-in temperature compensation provides outstanding accuracy over wide temperature ranges. 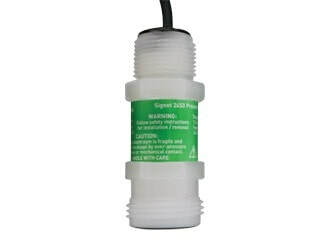 These sensors are available with a proprietary digital output (S3L), or field-scaleable 4 to 20 mA output. Dual-threaded ends allow submersion in process vessels, or in-line installation with conduit connection. Integral adapters (sold separately) may be used to create a compact assembly with a field mount version of the Signet 8250 Level or 8450 pressure transmitter. The 2450 Pressure Transmitter from GF Signet has a one piece injection molded PVDF body and ceramic diaphragm for superior compatibility in corrosive liquids.